Oftentimes, a pet store owner orders a frog species from a catalog, with little more knowledge about the frogs than the limited literature they may have in the catalog. So, it shouldn't be surprising that they will sometimes end up with a batch of frogs that are not what they ordered, or worse, they have no idea what they got and try to figure out what they are from the photos. Unfortunately, one of the most commonly mislabeled species I have run across in pet stores is the African Dwarf and Clawed frogs. Both are fully aquatic frogs, and both appear fairly similar when young. However, while generally they seem less fragile as pets, Clawed frogs also grow to be quite large! 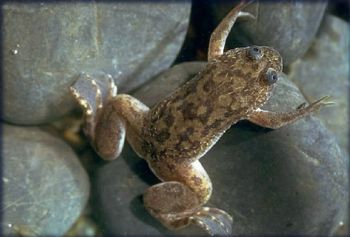 As big as a fist infact, while the Dwarf frogs never grow larger than an inch and a half in length. In addition, Clawed frogs are actually illegal in some states, such as California, and recently in Oregon. This is because some of these guys got loose in the water system and started eating EVERYTHING in sight! So, the question remains, how do you know if the cute little guy you bought at the pet store isnt going to grow really big, (and therefore shouldn't be kept in the same tank as small fish cause he'll EAT them!) and how can you tell if you need a get ready to buy a bigger tank for when your little guy starts to grow bigger? If your froggy is of the Albino variety, you can pretty much bet that it's a Clawed frog and should NOT be kept in the same tank as the Dwarf frogs because it will soon outgrow and then probably EAT the dwarfies! The photo on the right is a two-year-old Albino African Clawed frog, sent in by Scott & Vicky Edwards. Species Caresheet about African Clawed Frogs. African Clawed Frog (Xenopus Laevis) These frogs have kind-of claw-like front "hands". They also tend to have buggier looking eyes than the dwarf frogs. Compare the buggy eyes seen in this great photo that appeared in ABCNews.com's news story "Love Duet in the Pond" (Feb 16, 1998) about love calls of African Clawed frogs (seen on the right). African Dwarf Frogs (Hymenochirus boettgeri) These frogs are considerably smaller than the clawed frog cousins. They will have teeny black claw-like things on their hind feet, especially noteable when full grown, so the presence of "claws" isn't the best way to identify them. Your best bet is to look for the tell-tale flatter eyes. Also, the front hands of the dwarf frog have webbing between the fingers...while the front hands of the Clawed frog are more pointy-looking. 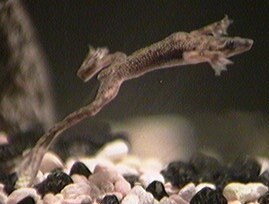 Many dwarf frogs appear skinny around the "waist" just above where the legs meet the body (see picture at right). 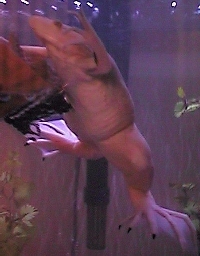 Compare this to the "pudgy" look of the Clawed frog in the same area in the photo above. However, I wouldn't count on how skinny the frog is as the best way to tell what sort of frog it is! The images on the left and right is a photo from tim@telalink.net. Species Caresheet about African Dwarf Frogs.